Bean To Cup Coffee Vending Machine From Amisy,A Great Investment For You! Ready to Make Extra Money With Bean To Cup Coffee Machine? If you own a company or manage concessions for a store you've probably tried many ways to make extra money from your food and beverage service. In today's busy world, employees and customers need their coffee anytime, not just before work. A bean to cup coffee vending machine can be just what the customer or the staff needs to get through the week. 1. The fine-durable grinding system is employed to grind coffee powder that can get a full dissolution. 2. 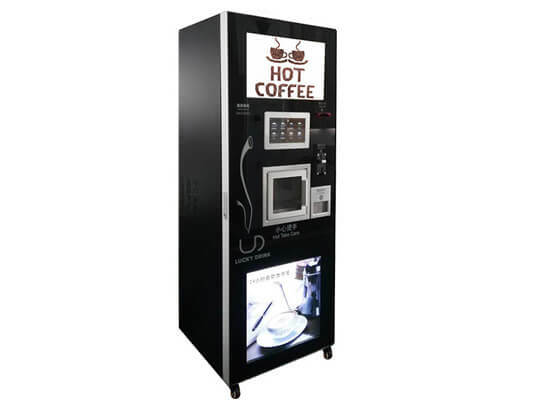 High-efficiency coffee-making system of the instant coffee vending machine makes pure coffee. 3. 1 Kg coffee bean canister beats hourly feeding raw stuff. 5. Standing type and tabletop type bean to cup coffee machine for choice. 1. Decide what type of coffee vending machines you would like to set up. Choose the machines and the merchandise that best meet your needs. 2. Register your business and get the necessary licenses and permits. 3. Search for vending machine dealers. Find a reputable supplier of quality vending machines. 4. Find good locations for your vending machines. Place your vending machines where there are so many people. 5. Negotiate with business owners or managers on the commission you pay them to get the appropriate commission rate in your business. 6. Visit your locations every few days to be sure everything is working well and fix the machine when necessary.